Paris Saint-Germain midfielder Julian Draxler has aimed a thinly-veiled dig at Liverpool in the wake of the Parisian’s Champions League defeat on Tuesday. The French champions succumbed to their first loss of the season against the Reds, in the opening game of their latest European campaign. Kylian Mbappe equalised late on for the visitors before Roberto Firmino struck the winning goal in the dying moments of the match, in what was a pulsating encounter at Anfield. Daniel Sturridge headed Liverpool into the lead 30 minutes in and James Milner extended the home side’s advantage via the penalty spot soon after. However, Thomas Munier halved their lead just before half-time, volleying home from a difficult position. The late drama in the Group C clash saw Jurgen Klopp’s men pick up their first three points of their latest Champions League venture, exorcising the demons of their final loss in Kiev against Real Madrid four months ago. 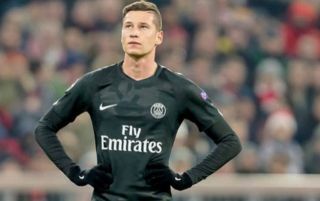 According to Metro sport, one man unhappy in the wake of Tuesday night’s result was Draxler, who in a subtle swipe at the Reds, suggested that PSG should be beating teams like Liverpool if they want to be taken seriously as contenders for the trophy. “We did not start very well. Liverpool led 2-0 but we also know it’s hard to score two goals here,”. The midfielder said post-match. “We deserved the draw but we recognise that Liverpool are a very strong team and Firmino showed that in the last few minutes. “In the first half we lacked aggressiveness. If you want to win the Champions League you have to take three points here and be more cunning. Draxler’s comments will likely anger Liverpool fans considering the status of their club as one of Europe’s powerhouses, having won the famous prize five times in their illustrious history. PSG have never advanced beyond the quarter-finals of the competition and if last night’s evidence is anything to go by, they may struggle to do so once again. Klopp will be confident that his team can go on to achieve great things this season after such a strong start to the year and perhaps even improve on last season’s runners-up finish in the Champions League by lifting the trophy in May.